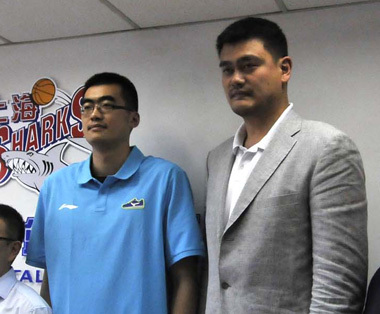 Since his return to China after retiring from the NBA, there arguably hasn’t been a more fascinating figure in Chinese basketball than Yao Ming (seen here towering over 7″3 center, Zhang Zhaoxu). As owner of the Shanghai Sharks, the team he bought in 2009, he has been given an opportunity to air his opinions on the state of the CBA. This, along with his massive popularity in China and abroad, has given him a unique platform to assert influence on Chinese basketball; something he has done in a very measured but noticeable way. But it is Yao’s ongoing war with the third foreign player slot that is taking up the majority of his time currently. The CBA has just finished its annual committee meeting that all the owners, including Yao, attended. Among the big announcements were league expansion, tv replays in games, how many foreign players can feature in the fourth quarter and an overhaul of lighting in CBA arenas. One thing that did not get changed, much to Yao’s disappointment, was the retention of the third foreigner rule that allows for teams who finish in the bottom five of last season- aka ‘the deadpool’- to have a third import who must be of Asian decent (this can include Middle Eastern players). With the addition of Jiangsu Tongxin and the Chongqing Dragons, it will mean at least seven CBA teams (over a third of the league) will have three foreign players for next season. Yao has long argued that deadpool imports take away playing time from young Chinese players who need it to develop their game and that it further increases the dependency that CBA teams have on overseas talent. When Shanghai were eligible last season for a third foreigner player following a bad season in 2012/13, Yao pointedly refused to implement the additional import slot. It was a ballsy move that paid off when the Sharks crept into that season’s play-offs against the odds. Given that the league has reduced the number of Americans allowed to take part in the fourth quarter, the fact that there was no change to the Asian foreign rule seems confusing and Yao’s opinion was eagerly sought after by the assembled press pack. The big man’s response was carefully measured to say the least; ‘I think its a paradox’, he noted, before adding ‘but this is my own personal feeling and I can’t go against the decisions of the [CBA] commission’. This is a classic example of the tact Yao typically takes by quietly making his point and then retreating. However, regardless of Shanghai’s place in Chinese basketball, this isn’t just any owner making an observation; it’s also the country’s most revered basketball player, whose opinion instantly carries a lot more weight. By several accounts, Yao has attempted to bring elements of what he saw in the NBA back with him into China but it is also interesting that he is very much of the old-school when it comes to the foreign players in the CBA. Remember, Yao came up through Chinese basketball at a time when overseas recruits were only allowed to play a combined four quarters the entire game so that he is a traditionalist should not be a surprise. Yao understands the star power some foreign players bring to the league but it is also clear he wants to get more chances for young Chinese players to develop, going as far as to say the league needs to be more ‘utilitarian’. Yao is obviously correct in that you can’t limit one kind of foreign player but not the other. However, the elephant in the room is that if there were good enough Chinese players, CBA teams wouldn’t be spending money on a point guard from Iran or Jordan to help them out. Yao is smart enough to know this and so instead of criticizing the other teams, advocating the removal of the deadpool may well force a more widespread overhaul of Chinese youth coaching out of necessity. Either way, Yao has once again got China talking about the third foreigner rule and if he has his way, people will keep talking until the deadpool slot is gone.